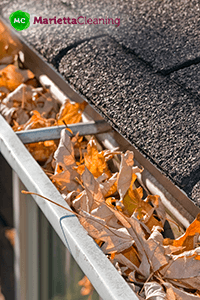 Clean your gutters on a regular basis! It’s essential when you have to prevent water damage to your house and maintain it in great condition. Keep your drainage system always clean and eliminate the risk of overflowing gutters that might damage the roof, walls and foundations of your property, as well as lead to mold and mildew. Dial (770) 285-7085 now, keep your home waterproof and prevent any costly repairs in the future. Trust our local cleaning company to take care of this very important house maintenance task with advanced equipment and environment-friendly solutions. A wet vacuum gutter cleaning machine with telescopic pole allows them to clean all dirt, leaves and small branches from the safety of the ground. No more climbing ladders and accidental injuries for you, no more broken tiles on the roof. There is also a small camera attached at the head of the vacuum machine to show you a live feed of this quick and efficient gutter cleaning process. It’s recommended to clean your gutters at least four times a year (every season) to make sure your home drainage system is well maintained. It’s especially important to do it before the winter, because the water can freeze and actually crack the foundations of your house. Our gutter cleaning teams are equipped with specialized wet vacuum cleaning machine that has carbon-fibre telescopic extension pole. With its help they can reach up to the fourth floor of a building, which is definitely more efficient in comparison to the manual debris removal and cleanup of your gutters. This modern cleaning technique makes ladders obsolete. Thus it also protects the exterior walls from accidental scratching and the roof tiles from damage. And of course, the main benefit of this gutter cleaning technique is that it’s safer for the person that does the cleanup. The small brush head at the end of the extension pole ensures detailed cleanup even in the tiniest areas of your drainage system. And with the help of the small camera you can see real-time images of the overall process.